Avital O’Glasser is an academic hospitalist and Associate Professor of Medicine within the Division of Hospital Medicine at Oregon Health & Science University. She is the Medical Director of OHSU’s Pre-Operative Medicine Clinic and the Assistant Program Director for Scholarship and Social Media for OHSU’s Internal Medicine Residency Program. Academic niches include peri-operative medicine quality and systems improvement, mentoring resident and student scholarship, and analyzing professional use of Twitter by physician. From my perspective as a hospitalist, perioperative medicine is an engaging opportunity for meaningful patient-centered care and coordination with multidisciplinary colleagues. While the body of perioperative literature has significantly expanded over the years, the guidelines still contain the dreaded missive “consider if it will change management” at multiple junctures. Plenty of areas of controversy amongst providers, or even society guidelines themselves, remain to challenge us. To stress test preop…or not to stress test? To start beta-blockers preop…or not to start? To order routine troponins postop…or not to order? However, there is probably no greater, or more infamous, area of perioperative controversy than the great ACEi/ARB debate! Mention the words “ACEi” or “ARB” at a perioperative meeting, and audible rumblings from the crowd will immediately be perceived. The room may even rapidly divide into two camps: think Capulets versus Montagues, or Jets versus Sharks (if you listen closely, I’m told, once the rumbling settles down, you might hear some faint snapping…). The debate does not neatly divide into hospitalist versus anesthesiologist lines, and the debate spans international borders. But let us retreat for a moment. WHAT is the source of the controversy? What is the clinical conundrum? ACEi/ARBs became linked with intraoperative hypotension after induction of general anesthesia. General anesthesia, because of its blunting of the sympathetic nervous system effects, very commonly causes hypotension–and ACEi/ARBs inhibit the ability of the RAAS to recover blood pressure. For more info, Auron et al wrote an incredibly detailed review of the pathophysiology. Ongoing reports from anesthesiologists without high-quality new literature landed this question in the “anecdote versus actual” category. This led to years of practice variation. Where and when did the legend begin? Since captopril and enalapril were developed in the early 1980s, prescription rates have significantly expanded based on evidence of efficacy in multiple conditions including heart failure, hypertension, diabetic nephropathy, and other indications. Estimates of prescription rates in the surgical population range from 33% to 43% –so this is a common clinical question applicable to millions of the over 300 million adults having noncardiac surgery worldwide annually. The downstream concern (hypothetical or real depending on your position), is that intra-operative hypotension then increases the risk of postoperative adverse outcomes, including postoperative hypotension, major adverse cardiac events (MACE), stroke, other morbidities, and mortality as well as increased length of stay. 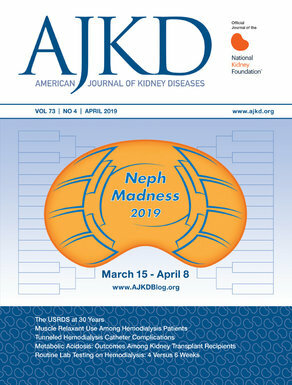 Additionally, and here’s why this clinical question is so important to NephMadness and nephrologists, is the possibility of postoperative acute kidney injury (AKI) due to intraoperative hypotension. Many remained divided on whether intraoperative hypotension was a concern in and of itself, or if the intraoperative hypotension was a surrogate marker (appropriate or inappropriate) for the long-term downstream complications. Until recently, the body of surrounding literature remained small, low-quality, underpowered, and did not include any RCTs. The early literature from the 1990s (predominantly French) comprised small studies such as case reports and case series regarding intraoperative hypotension including severe hypotension requiring vasoconstrictors, and decreased responsiveness to vasopressors when hypotension occurred. A small RCT in 1994 found 100% of patients who took their usual dose of captopril on the day of surgery (DOS) required ephedrine after induction. Publications also linked ACEi use to increased postoperative mortality with coronary bypass and vascular surgery, but it was difficult to generalize this information to non-cardiovascular surgeries. Within the last decade, the available literature has grown A 2008 meta-analysis (5 studies totaling 434 patients) found that hypotension occurred in 50% of patients taking ACEi/ARBs on DOS, with a RR of 1.50 (95% CI 1.15-1.96) of hypotension at/shortly after induction of anesthesia requiring pressors. A 2012 retrospective study specifically examined respiratory complications, given the association between ACEi with cough, bronchospasm, and angioedema. ACEi use was not associated with 30-day mortality or the composite of in-hospital morbidity/mortality. Intraoperative hemodynamics, vasopressor use, and fluid administration appeared similar between the groups. A 2014 retrospective, single-institution study examining 922 orthopedic surgery patients found that those who continued ACEi were more likely to develop hypotension after induction (12.2% vs 6.7%, P = 0.005, OR 1.93) and postoperative AKI (8.3% vs 1.7% ,OR 5.4, P < 0.001; OR 2.60 after adjusting for covariates including hypotension, P = 0.042). AKI, when it developed, was associated with significantly increased length of stay (5.76 vs 3.28 days, P < 0.001) but there was no statistically significant difference in 2-year mortality (5.9% v 2.4%, P = 0.211). Fluid and pressor management was not standardized in this study. The evidence remained conflicting and controversial. Even the major society guidelines failed to reach a consensus. The 2014 ACC/AHA perioperative guidelines issued a Class IIa (LOE B) recommendation that continuation of ACEi/ARBs perioperatively is reasonable. The 2017 Canadian guidelines recommended withholding ACEi/ARBs 24 hours before noncardiac surgery (strong recommendation, low-quality evidence). Of note, their supplemental tables 30 and 31 nicely outline the 3 RCTs they used to draw their conclusions (total 188 patients). All the studies showed increased risk of intraoperative hypotension with medication continuation (pooled RR 2.53), though the data was insufficient on cardiovascular complications. The 2014 ESC/ESA Guidelines uniquely focused on the indication for ACEi/ARB therapy, recommending 24-hour discontinuation if prescribed for hypertension but continuation for clinically stable patients with LV systolic dysfunction/heart failure, albeit with close monitoring. The last two years have seen a wave of new publications that significantly add to our understanding of the conundrum. In 2017, a large international prospective cohort study (N = 14,687) from the VISION group was published. The primary composite outcomes (all-cause death, stroke, myocardial injury) was significantly improved in the group who held ACEi/ARB within the 24 hours before surgery with an 18% adjusted relative risk reduction (12.0% vs 12.9%, aOR 0.82, P = 0.01). The secondary outcome of intraoperative hypotension (though just a “yes/no”, not magnitude or duration) occurred less often in the withhold group (OR 0.80, P < 0.001). However, renal function or AKI was not captured. After this publication, many longtime naysayers began to move into the “hold ACEi/ARBs” camp. However, the literature expanded, and questions were again raised, just a year later with the publication of a large systematic review/meta-analysis of 9 studies totaling 6,022 patients on chronic ACEi/ARB having noncardiac surgery (more than 10x larger than the 2008 meta-analysis). In this group (which included the VISION study from the year prior), withholding ACEi/ARBs on the DOS was not associated with increased mortality (OR 0.97, 95% CI 0.62-1.52) or MACE (OR 1.12, 95% CI 0.82-1.52). However, withholding them was associated with a 30% relative risk reduction of hypotension (OR 0.63, 95% CI 0.47-0.85). No data was available on LOS. Finally, the largest RCT on the subject (well, ACEi alone, not ARBs…) was published last year. In this single-center study, 291 patients were randomized. Intraoperative hypotension occurred significantly less often in the omission group (55% v 69%, RR 0.81, P = 0.03, NNH 7.5). The NNT to prevent intraoperative hypotension requiring vasopressors was 6. Postoperative hypotension occurred less often in the omission group (RR 0.49, P = 0.02) as did postoperative HYPERtension (RR 1.95, P = 0.01)–NNT and NNH for both were 9. There was no difference in AKI or MACE. Anesthetic management was not controlled for. The authors found their results aligned with the growing body of literature, and the invited commentary strongly advocated for adoption of policies for withholding ACEi and ARBs 24 hours before major inpatient noncardiac surgery. The other question looks at the other end of the perioperative continuum. What happens after surgery? When should these agents be resumed? The 2018 JHM study just discussed, showing the risk of postoperative hypertension as well as hypotension, helps us advocate for having protocols to resume these agents as soon as clinically feasible and appropriate, i.e. once hemodynamic stability and stable volume status are restored. Cycling back to the 2014 ACC/AHA guidelines, concern was also raised for the risk of inappropriate discontinuation after surgery (i.e. held and not resumed), and included a Class IIa recommendation that if the agents are held before surgery, “it is reasonable to restart as soon as clinically feasible postoperatively.” Another 2014 retrospective study of a large VA cohort found that 25% of patients did not resume ACEi within 14 days of surgery, which was associated with a statistically significant increased 30-day mortality (HR 3.44, P < 0.001). While the literature has expanded, it remains limited, without a large, multicenter RCT. As with any critical appraisal of the literature, it is essential to know what the studies measured and what they reported. As you can see from this review, there is heterogeneity with ACEi and/or both ACEi/ARBs being studied, cardiac complications (and how those were defined), capturing of anesthetic management (pressors/fluids), and whether or not AKI was even included in the study. Based on institutional practice and review of the literature, I almost always hold for patients having surgery with general anesthesia. For patients having surgery without general anesthesia, I consider holding based on the chance that the case will need to be converted to general anesthesia or have other reasons to precipitate hypotension (eg spinal/epidural anesthesia). For patients with fragile heart failure prescribed low dose ACEi/ARB for afterload reduction, I consider continuing based on the nature of the surgery, including length and planned anesthetic course. For patients with difficult-to-control hypertension, I consider continuing depending on their baseline control and the other agents they are taking (for example, I will more likely continue thiazide diuretics on DOS while still having a patient hold their ACEi/ARB). And, finally, I continue to await the first large, multicenter RCT on the subject.